Welcome to use GPE4860C. 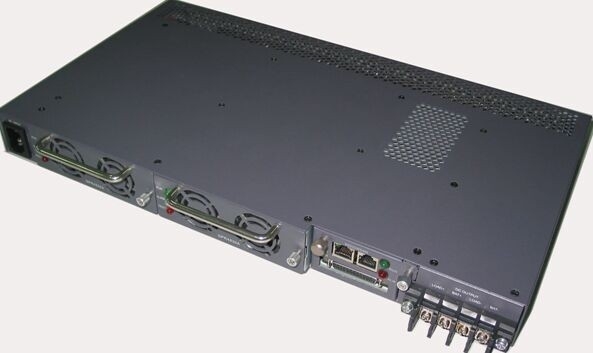 It consists of the power distribution frame, monitoring module and rectifier module. The whole system is of high reliability and performance, and can be operated through PC software. For details, please refer to the specifications of rectifier and monitoring modules. Under normal conditions, every parameter of rectifier modules and distribution unit are all under control of the monitoring module, operating according to the pre-set parameter or user’s commands. If AC mains fault, the system will be powered by the battery. With the battery discharge, the terminal voltage of the battery starts to descend. When the battery voltage is under 42V±0.5V, the monitoring module reports battery under voltage alarm signal and cuts off the load output, then the power system stops working. When the external AC mains recovers, the system will resume to the normal work state. (All above monitoring data are system default values that users can reset). Except for battery over-discharge protection, battery or load over-temperature protection is prohibitive under default, users can send command to activate or inactivate according to the demanding. When the operating temperature is 55°C or more, power de-rating will be employed by system. After 1-hour operation at low temperature, apply 0.1uF film capacitor and 10uF HF electrolyte capacitor, oscilloscope band width of 20MHz, with 20CM twisted pair. No flashover and breakdown, with discharge tube removed. Forced cooling, front-in & rear-out, the fan is located inside the front panel, with speed programmable by the temperature. The unit can operate when the diameter of dust particle is more than 5µm, with density ≤3*104 /m3. The dust shall not be conducting, electromagnetic or corrosive. First insert the embedded power module to the specified location till the system is well fixed. Keep the 4 fixing holes on the bracket in line with those on the cabinet and then screw up 4 M4 cross rounded head screws, with the spring washer and flat washer. At last finish the installation after tightening the screw. 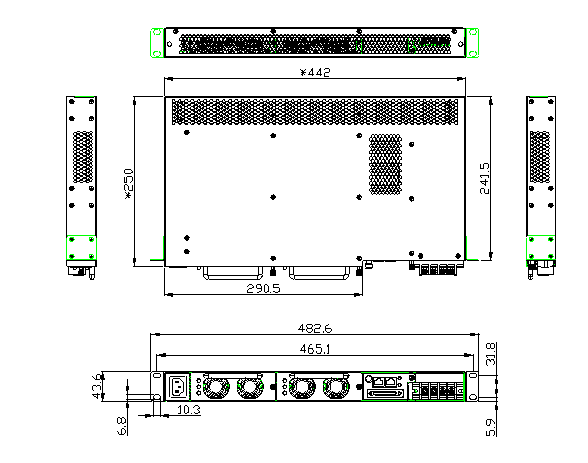 Electric connection between main cabinet and external component includes: connection of AC input line, connection of DC output and battery, connection of communication cables, connection of GND cables. The main requirements of electrical connection are safety and reliability. The followings are detailed description. The connectors for AC input cable are three-core AC input sockets on the front panel of system. The AC cable can be directly inserted to the connector. The terminals for output connection of power system are one screwed binding posts (4 P) and the terminals for load connection are LOAD+ and LOAD- (2PIN), locating on the front panel of the system. The cable can be directly crimped into the terminal. The fixed M6 screw of the bracket at the right functions as PE input. RS-485-communication cable terminal of GPE4860C, locating on the front panel of monitoring module, functions as communication with the host. B. Connect the other end of communication cable to RS-485 of the host. “+”, “-” cable of RS485 in GPE4860C respectively correspond to “+”, “-” cable of RS-485 in the host. A. Connect one end of communication cable to LAN port on front panel of GPE4860C. B. Connect the other end to Ethernet or directly apply the crossover cable (Cable 1 with cable 3, cable 2 with cable 6) with the PC. To send controlling orders or to get data from the rectifier module via RS485 communication. To manage low voltage, power down, equalizing/float charge, temperature compensation of the battery. For details, please refer to specifications of “GPM48M”. Handles on panel of rectifier module and monitoring module are equipped. When inserting component into the main cabinet, the operator shall clutch the handle with one hand while holding it with the other hand. Slowly push the component into its slot until the connection terminal on back of the component inserted into corresponding socket of system bar in the main cabinet. Finally, finish the installation by firmly fixing the screw on the panel to the main cabinet. When removing component from the main cabinet, first screw off the bolt on panel then slowly remove the component from its slot while clutching the handle. With 0.1uF filmy capacitor and 10uF high frequency electrolyte capacitor, oscilloscope band width of 20MHz. Hysteresis not less than 5V. Auto recoverable under ambient temperature of 65°C. For details, please refer to specifications of GPR4830A. Shutdown under situation of output over-voltage, over temperature, dual fans failure, short circuit at load side or no output caused by internal errors..